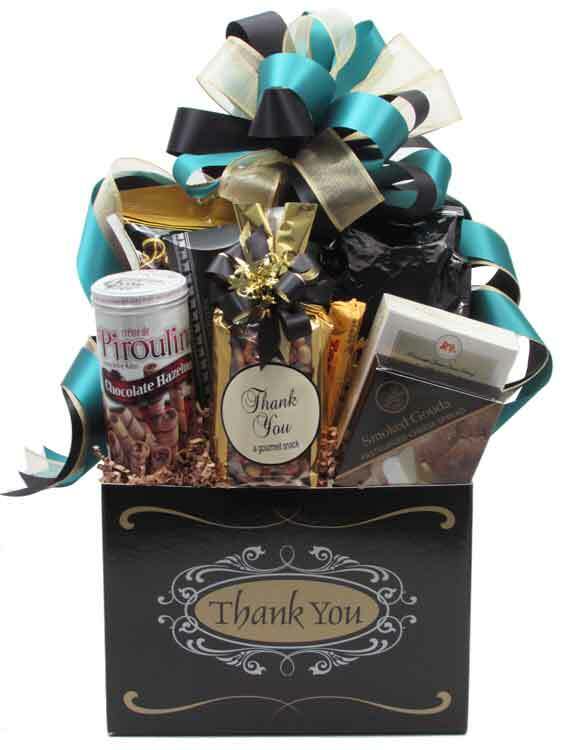 Show your appreciation with this great looking gift basket arrangement! Wrapped in crisp clear cellophane and topped off with a handmade bow. Includes a Handwritten Greeting Card. Thank You Plus: Filled with a tin of Chocolate filled Wafer Roll Cookies, Nuts, "Thank You" Snack Mix, Toblerone Chocolate Bar, Cheese, Cheese Straws, Natural Smoked Sliced Summer Beef Sausage, Pretzel Twists (Salted Caramel, Smoky Barbecue, or Cheese Pizza), Gourmet Popcorn (Almond Pecan, Cranberry Walnut, Dark Chocolate with Sea Salt, or Caramel with Jalapeno Cheddar), and a box of Focaccia Crisps Crackers. The Popcorn is made here in the Dallas area and the Nuts & Snack Mix are from Texas companies. Finished wrapped and decorated design is approximately 17"h x 11"l x 8"w.
Thank You: This Thanks A Million container is filled with creamy Fudge, Salted Peanuts, Cheese, Dark Chocolate filled Butter Wafer Cookie, White Chocolate Amaretto filled Butter Wafer Cookie, Natural Smoked Sliced Beef Sausage, Crackers, and gourmet Popcorn (Almond Pecan, Cranberry Walnut, Dark Chocolate with Sea Salt, or Cheese & Caramel). Cookies & Popcorn are from the Dallas area and the Fudge and Peanuts are from Texas companies. Finished wrapped design is approximately 14"h x 8"w x 5"d. Container size is 6 3/4"w x 4"h x 5"d.
NOTE: We have sold out of the large container for Thank You Plus, but we can design in a basket. Photos coming soon.